Destroyer could earn Nicole Kidman some consideration for an Oscar nomination and the gritty neo-noir storyline about obsession, guilt, and betrayal is worthwhile for those who appreciate the genre, but the movie seems destined to be lost in the shuffle of year-end releases. Directed by Karyn Kusama (Girlfight), this movie takes a familiar crime story concept and gives it a unique spin by gender-bending it. It also shovels in the regret of a mother who hasn't been there for her child and is now trying to make amends. This plot element reflects something similar in Vox Lux, another late 2018 release featuring a great lead performance (that one by Natalie Portman) that's likely to vanish with little trace. When we meet Detective Erin Bell (Kidman) in the film's primary time frame, she's a burnt-out cop on the wrong side of 40. Her appearance is haggard. She looks like she feels - old and worn-out. But now her routine world of booze, hangovers, and self-destructive impulses is given a jolt by the return from obscurity of Silas (Toby Kebbell), the enemy whose actions precipitated her downfall. Following clues, she tracks Silas through some of his old associates, including his ex-girlfriend Petra (Tatiana Maslany), narrowing the noose. Meanwhile, she steps through the minefield of old memories that reveal the reasons for her current state - how, 17 years ago, as an undercover cop, she and her partner, Chris (Sebastian Stan), became romantically involved while infiltrating Silas' gang and made a fateful decision whose implications have haunted Erin since. Although she cares about her teenage daughter, Shelby (Jade Pettyjohn), and sees the girl's boyfriend, Jay (Beau Knapp), for what he is, she feels inadequate to the challenge of being a parent - a role she has ceded to her ex, Ethan (Scoot McNairy). Now, with past and present colliding, she struggles to find an elusive path to redemption. The movie's dual time-frames run in parallel with the flashbacks proceeding chronologically as current -day events move toward a climax. However, Kusama does something unexpected with the way she interweaves these strands that results in a surprise "ah ha!" moment. This gives the film a bit of a twist that it might not have had if the narrative had progressed in a strictly linear fashion. 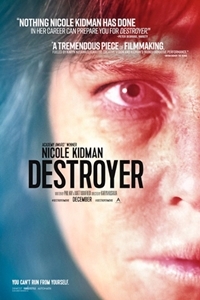 Kidman's performance is Destroyer's hallmark. Like Christian Bale (in more than one film) and Charlize Theron (in Monster), Kidman undergoes a complete transformation to play Erin. In the flashback sequences, she looks recognizable but the same cannot be said of the current-day scenes, where she fits the viewer's expectations of someone who has undergone a decade-and-a-half's worth of psychological and physical self-abuse. This isn't the first time Kidman has gone the extra mile for a role - her willingness to buy into a director's vision has characterized projects as different as Billy Bathgate and The Killing of a Sacred Deer. Not since her Oscar-winning turn in The Hours has she so thoroughly obliterated her own self in the service of a performance. Kusama keeps the tone dark, eschewing turning this into anything resembling a traditional crime story. Although there are thriller elements in the plot, this is first and foremost a character study about a woman who, having reached a critical juncture, attempts to make amends for her sins. The film builds toward the showdown with Silas with slow, methodical precision. However, although we may be unsure how that will end, we know with certainty how the flashback portion will conclude, although there are a few small details to be revealed. Whether or not Kusama made this film with the intention of proving that this kind of story, often presented with a male character and from a male point-of-view, can be as compelling (and perhaps even more so) with a gender-flip, she has achieved that. Nihilistic in every aspect of production, Destroyer illustrates how obsession that germinates from a soil poisoned by guilt can result in a bloom devoid of an audience-satisfying catharsis. To the last, the film is true to its nature.